Debate in Tehran: Stay in the JCPOA or Leave It? Home » Perspectives Papers » Debate in Tehran: Stay in the JCPOA or Leave It? EXECUTIVE SUMMARY: A heated debate is underway in Tehran over whether or not to remain in the JCPOA following the US withdrawal. President Rouhani believes the cost of leaving is too high, but hardline Iranian conservatives – who never wanted the deal to begin with – want out. It remains to be seen what Supreme Leader Ayatollah Khamenei will decide. Following the US withdrawal from the Iran nuclear agreement formally known as the Joint Comprehensive Plan of Action (JCPOA), President Donald Trump has re-imposed unilateral sanctions on Iran, targeting the country’s core banking system, oil sales, and conduits to the global financial system. The most onerous sanction of all is preventing Iranian banks from using the Belgium-based Society for Worldwide Interbank Financial Telecommunication (SWIFT) network, the largest electronic payment network in the world. The harsh measures have set the stage for a revival of political infighting within Iran’s complex and opaque political structure. A heated debate is going on among political elites and in the Farsi media in Tehran over whether to remain a party to the nuclear agreement or withdraw from the pact. A review of Farsi media outlets indicates that President Hassan Rouhani and his followers believe Tehran should remain because “the cost of leaving the deal is too high for the country.” But his rival force, the conservative camp, is preparing to exit the nuclear agreement – which it opposed in the first place. Fearing the conservative scenario, the EU, along with China and Russia, embarked on an unprecedented effort to find some way to help the Iranian regime get around the US sanctions. They eventually came up with a new payment mechanism known as the Special Purpose Vehicle (SPV), an autonomous payment system that would allow Europe to transact with Iran while avoiding secondary US sanctions. The Rouhani government welcomed the initiative, hailing it as a step that not only helps Iran repatriate its oil revenues but moves it away from the dollar-dominated financial system, a process that can eventually undermine the effectiveness of US sanctions. But the mechanism was not well received by the rival hardline faction, which called it a symbolic gesture that will not help Tehran repatriate its oil revenues. From their perspective, the SPV is something like Iraq’s Oil for Food Program (OFP) of 1996, which only allowed Baghdad to sell oil to pay for food and other national humanitarian needs. While it is not really like the OFP, the SPV trade mechanism is in fact somewhat akin to the “barter system” that was used by the Soviet Union during the Cold War. In plain English, buyers of Iranian oil are not going to pay Tehran directly, but are going to deposit Iran oil revenues into an account at a firm in a European country. Any company that imports goods to Iran could claim a credit from the SPV as payment. Even with that, several hurdles remain, including the reluctance of member states to host the financial structure due to fear of antagonizing Washington. France and Germany agreed to take charge of the trade mechanism, but only if its new goals could encompass less sensitive items like humanitarian and food products rather than crude oil. Supporters of the deal in Tehran understand that leaving the nuclear agreement would cost Iran dearly. It would automatically bring UNSC resolutions back into force and snap back multilateral sanctions if Iran is found to be noncompliant, a situation that may cause Russia and China – Iran’s close allies – to join the US in sanctioning Tehran. Fararu, an outlet close to the Rouhani government, warned that Iran will not be able to bear the costs of leaving the deal because it will once again be identified as a threat to global peace and security. According to Fararu, “Iran’s best bet is to find a joint solution with EU, Russia and China to isolate the United States,” rather than rushing to leave the nuclear agreement. The hardline faction has the upper hand in Iran’s political establishment, and will probably be able to weaken and sideline the Rouhani government. For hardline conservatives, Iran’s export of crude oil and ensuring of its oil revenues are the key factors in deciding whether or not to leave the deal. 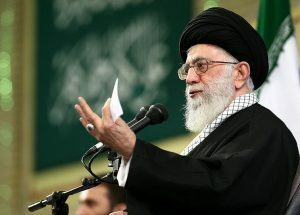 Ayatollah Khamenei, who is essentially a hardliner, will have to decide whether to side with the Rouhani government or with the conservatives. In making this decision, he will take into consideration the costs of leaving the deal and the possible reactions of the US, Israel, and other stakeholders.